Eckhardt Trading Company (ETC) founder and Chief Research Scientist, Bill Eckhardt, is a founding father of the CTA industry, active since its birth in the 1970s. ETC’s unique strategy and process fuses Eckhardt’s hands-on trading experience with distinctive, and sometimes iconoclastic, academic and philosophical foundations – and rapidly evolving proprietary research. ETC’s entirely technical, volatility trend-following and short-term trading strategy has a differentiated return pattern. ETC has not made a conscious effort to decouple from peers, as the firm does not pay attention to what competitors are doing. But ETC has produced a different return profile, seen markedly in the first two months of 2018. Having made c.9% in January, ETC’s flagship Evolution strategy only gave back c.3% in February, which was the second worst month ever for the SG trend-following index. “ETC’s shorter term trend, non-trend and counter-trend models, helped to soften the blow of losses from its medium-term trend models,” says COO, Rob Sorrentino. ETC was exclusively a volatility trend follower until 2012. ETC’s correlation to trend-following indices is pretty stable at 0.6 to 0.65. “Correlation is of limited value however, as it measures only a common direction, and not the extent of the direction. Correlation masks substantial dispersion in returns,” says Sorrentino. Longer lookbacks also show a performance pattern that is somewhat atypical for CTAs. Traditional trend-followers’ best years of the past ten were 2008 and 2014 whereas the best two for volatility trend follower, ETC, were 2007 and 2010. Focusing on 2007 and 2008, ETC started to pick up on the expansion of volatility in 2007 moving into early 2008, and then played late 2008 very differently from many other CTAs that made most of their returns in the fourth quarter. ETC made the bulk of its profits in the first half, before dialling down exposure later in the year to an average margin of 4% and 350 round turns per million. The tendency for CTAs to perform well during “risk off” periods, such as late 2008, has contributed to the term “crisis alpha”. Data-hungry ETC are cautious about whether there is enough data to be confident about this recurring. ETC’s perspectives and performance come from diverse sources. 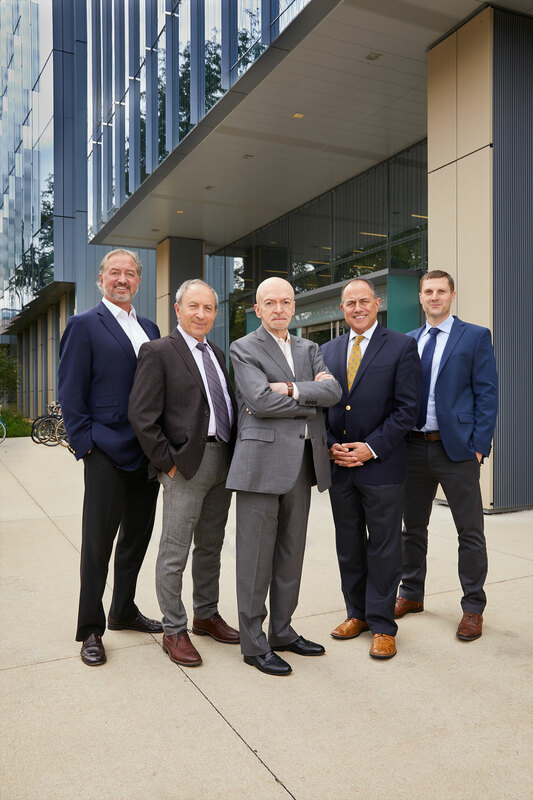 (L-R): John Fornengo, President and Chief Risk Officer; Vartan Paylan, Deputy Chief Research Scientist; Bill Eckhardt, Chairman and Chief Research Scientist; Rob Sorrentino, COO and CCO; Stan Fiedor, Senior Research Scientist. Standing in front of The William Eckhardt Research Centre, The University of Chicago. The first 20 years of Eckhardt’s career were spent proprietary trading in Chicago. This experience inspired his lifetime’s work of creating his Science of Trading, which is the DNA behind the firm’s 27 year track record. Eckhardt had been researching trading systems since his teenage years in high school. He and Richard Dennis developed the “Turtle Trader” programme that has spawned many successful CTAs; the two of them jointly received the 2016 Pinnacle Achievement Award, presented by CME Group. Having started trading with discretion in the style of a trend follower, Eckhardt set up a small account following a mechanical system, and found it consistently outperformed his discretionary trading, year in, year out – in mediocre years, and in banner years. “The system out-traded me, partly because my trade sizing was based on optimism, pessimism and recent mistakes. Trading mechanically protects against all of that so it is not so emotionally wracking,” he says. ETC is fully systematic yet it retains a discretionary safety valve for risk management purposes. Eckhardt is of the opinion that mechanical trading, with a safety net of rare human overrides, is the best approach: “if you never exceed risk parameters, it means you are trading too small. It is better to trade closer to where you want, and then if risk rises above a threshold, manually override”. When Eckhardt started trading systems in the 1990s, interventions took place many times a year but now happen maybe once a year – and just six times over the past five years. “We have learned to design systems that do not get you into places where you would need to override, but we are still ready to do so should the need arise. So, we need people who understand the tempo and feeling of systems, so they can tell when something is off,” says Eckhardt. Historically, ETC has exercised what Eckhardt terms the “Chernobyl option” of cutting risk by 70-80%, around the second Iraq war or 9/11 – and this involved booking big profits. If you never exceed risk parameters, it means you are trading too small. It is better to trade closer to where you want, and then if risk rises above a threshold, manually override. “Though I spent many of my early years observing both floor trading, and away from the floor multiple other global markets, I would not be the same kind of trader without the academic experience,” reflects Eckhardt. His academic study and research have provided the broad analytical and intellectual framework in which ETC’s systems evolved, and also more specific aspects such as the statistical approaches and optimisation techniques used. Eckhardt acknowledges that “mathematical logic per se is ivory tower stuff that has very little to do with futures trading but learning all kinds of maths up to the doctoral level was invaluable for reading technical papers that have proved to be absolutely essential”. He adds “the history of science and ideas has also helped me to form a theory of trading. For instance, when scientists first tried to understand how cannonballs projected, they used models with false but simplifying assumptions, with complications added later. It is similar with trading, in that the variable we are most interested in is price – and we need to simplify, but not oversimplify. The philosophy and history of ideas teaches you what sorts of inferences are warranted, and all the mistakes you can make in theory-building”. In hiring, ETC also veers towards maths and science. “ETC has a bias to the hard sciences. ETC are looking for computational, research and programming skills, which can come from physics, maths, engineering or even linguistics,” says Sorrentino. Bill Eckhardt has endowed the multi-disciplinary University of Chicago’s William Eckhardt Research Centre, which is mainly to further human knowledge – but also provides a powerful resource to help with research projects. Eckhardt has an office in the building to maintain contact with students. The cooperation is two-way, and it can sometimes add as many as six students from the Master’s in Financial Engineering course to the ETC R&D headcount. ETC benefits further on the recruiting side, having just employed on a permanent basis one of the research interns on completion of their Masters. “That said, there are always exceptions of people who are particularly curious, and demonstrate ability, with good statistical sense, who have studied different subjects,” says Sorrentino. ETC has a bias against hiring economics graduates and MBAs, “who need to be substantially educated out of market orthodoxies such as the Efficient Markets Hypothesis (that in their defence are pretty much right),” says Sorrentino. ETC characterise the EMH “as being nearly right over long or short enough time horizons, it is hard to see price movements as anything other than random. In signal processing language, we view 99% of price changes as noise and 1% as signal, which raises the risk of over-fitting. A badly designed system may still identify trends and patterns within the randomness, just as humans shown a random chart can point out patterns,” says Sorrentino. Bill Eckhardt speaking with University of Chicago Research students at The William Eckhardt Research Centre. “Even with a really powerful optimisation technique there is a danger of over-fitting to some extent. I have championed and promoted the word over-fitting because curve-fitting relates to non-linear regressions, and there are no curves. Over-fitting is the biggest pitfall of all and so many organisations perish due to it. But it is also clear that you can under-fit,” says Eckhardt. Eckhardt has developed in-house tests aptly named “The Gauntlet” which protect against over-fitting. “If there is too much over-fitting, we have to discard a model no matter how good it looks. ETC want to distinguish between permanent and transitory features of pricing and fit to the permanent ones. But there is no principled way to distinguish between the two, so we end up also fitting to some transitory features,” acknowledges Eckhardt. As a result of “The Gauntlet”, thousands of models are thrown out (or returned to the drawing board) due to over-fitting – but also for other reasons, where returns are too clumpy and concentrated over too small a time period. “We do not want something that just works explosively and then coasts along,” explains Eckhardt. Each potential model is subject to an extensive team review process, multiple tests and of course whatever the outcome of “The Gauntlet” may be the buck stops with Eckhardt. A whole library of systems is currently lying latent but could spring into action, when and if they can be honed and refined to meet the criteria. Eckhardt’s academic study and research has helped to determine which statistical methods to use, and which to avoid. ETC eschews the orthodox paradigm of summary statistics, normal distributions and Value at Risk, which have proved to be pitfalls for some managers. “In the 1970s, reading Benoit Mandelbrot’s work on fractals first gave me the idea that financial markets were far from normal, and therefore it was just crazy to use normal distributions. I took samples of 300 trades and found levels of deviation that would not occur for millions of years under a normal distribution. I became convinced that normal distributions had absolutely no application to trading,” he says. From the start, Eckhardt insisted on “robust statistical tests, procedures and estimators, such as distribution-free estimators, on the basis that it is not possible to make assumptions about distributions (or at least not strong ones)”. “Oversized samples are needed to have the same degree of assurance and cope with leptokurtosis or fat tails, which make the inference problem much harder, and so require much more data to make a warrantable conclusion. ETC need to see a huge sample of trades to have confidence that a model works, and every system needs to clear through all safeguards”. ETC generally tests over 20-year lookbacks. ETC’s universe of 72 markets including metals on LME are chosen to match its style of trading and level of assets. “Eckhardt’s study of evolutionary biology and population statistics has been most directly relevant for the algorithmic optimisation and AI components of optimisation for the ETC project, which are a real hallmark of the approach,” says President of the firm, John Fornengo. At first, Eckhardt had studied them for intrinsic reasons and the trading application proved to be incidental. ETC has been using an “evolutionary computing” optimisation process from the start. “We had to design our type of evolutionary computing from the ground up to apply to optimising trading systems, because the popular type – genetic algorithms – was too slavishly imitating evolutionary biology. ETC’s computing systems are designed specifically for futures markets,” says Fornengo. “The idea behind evolutionary computing is fairly simple: to treat the problem as a gene sequence of numbers, with millions of possible variations being genomes. Running the system leads to fitness, and better performance is better fitness: the performance of the best systems in the gene pool gets better and better,” he explains. “As in real evolution, mutations and crossovers are usually harmful, but occasionally good, so one needs to find ways to retain them. With no mutation, there is no evolution, and some genetic algorithms used in engineering or biology literature cannot cope with mutation. Our evolutionary algorithms are not nearly as delicate or chancy – they can function with a 100% mutation rate,” he adds. ETC also draws on evolutionary biology in using expected utility as a yardstick for measuring fitness, whereas other managers may use performance, Sharpe ratios and risk measures, which could be more susceptible to overfitting, according to Fornengo. When developing a theory of trading, Eckhardt wanted to unemotionally decide which bets were the right ones and reduce subjectivity. He stumbled on risk aversion as part of utility theory, which considers non-linearity: the diminishing marginal utility of profits, and the increasing marginal disutility of losses. “After 25 years of research, looking at all types of risk control and performance measurement systems, we think utility theory is the right way to think about risk,” he says. Subjectivity only comes into risk aversion, and the rest of the theory is developed objectively. “ETC believe their expected utility metric is rather unique and is more holistic in incorporating performance, drawdowns and the entire distribution of results, all of which requires decades of price data and a lot of computing horsepower,” says Sorrentino. “Expected utility also lets us observe the fitness of recombined systems,” he adds. ETC is targeting utility, rather than returns or volatility. Some CTAs have seen their own strategy volatility collapse in line with the markets over the past 20 years. Eckhardt has not. Though volatility has in fact been in a fairly tight range of 12-14% most of the time, this is not by design. ETC has looked at targeting volatility but believes that this would reduce performance. Nonetheless, ETC does have plenty of risk controls that indirectly help to keep volatility low and within client risk appetites. From his early days observing a wide range of commodity futures pits, when volatility was far greater than it is today, soy beans for example at three times today’s level, Eckhardt had to know what the risks were. The ETC volatility trend-following process starts with volatility, and later looks to capture trend and other moves. Basing the whole platform of research on volatility differentiates ETC from other trend followers and short-term traders. The rationale is partly pragmatic: Eckhardt finds it is easier to accurately estimate volatility, than directional returns. “Therefore, risk control should be the primary goal, and profitability the secondary one. We spend less time on market direction, and more time on asking if the risk is right for the situation and use volatility for other trading decisions,” says Eckhardt. Notwithstanding all of these diverse academic influences, ETC’s research has been mainly proprietary, rather than based on academic research. And nobody should assume that everything Eckhardt has studied or written about has been germane to his trading. Eckhardt is a real polymath, who has studied many disciplines for intrinsic reasons, and can talk to world class experts on a range of subjects. He has authored books and papers on areas such as Paradoxes in Probability Theory, and the Doomsday papers, that have no relevance to his trading systems. Some quant managers consult academics, but Fornengo says that with Eckhardt, it is the academics who consult him: he serves on the International Advisory Board of the Pacific Institute of Theoretical Physics; and is a member of the University of Chicago Visiting Committee to the Division of Physical Sciences. Thus, ETC’s biggest differentiator is thought to be how it assesses the volatility environment, before trying to capture trends. “This does not necessarily lead to faster signals, but better signals,” says Eckhardt. ETC aims to both enter and exit trends earlier, and at different times, than do traditional trend followers. For some trades and time periods, ETC’s trend trades will overlap with those of other trend followers. But unlike some CTAs, ETC does not always have positions in all markets traded. ETC is not necessarily concerned about what proportion of trends it captures, but rather more about whether it is taking the appropriate risk for the market environment, based on volatility. Position sizes are also adjusted to avoid too much risk in correlated markets. ETC is not just an opportunistic and selective trend follower however – ETC defines and identifies trends differently. They need to occur within a specific environment, and an erratic-ness indicator is intended to reduce trend exposure in adverse environments. ETC has also recognised that in a post-GFC climate that has not been conducive to trend-following in most years, trend systems needed to be complemented with other systems able to cope with non-trending markets. Both trend neutral models, introduced in 2017, and counter-trend models, added in 2012, have been used. (The countertrend models currently are being reviewed and may be re-instated at some stage in a modified form). “Allocations to the systems are based on a mix of art and science, including research and historical analysis,” says Sorrentino. Eckhardt argues that traditional trend systems were already starting to get stale in the 1970s. ETC reckon a higher volatility climate helped CTAs in the 1990s, while central bank intervention dampening down returns has made it harder to find any profits. This underscores the need for an evolutionary approach adapting as markets change. ETC find that alphas now decay faster than historically, because participants are more sophisticated, and ideas get disclosed faster. ETC do not wait for alphas to decay and degrade before upgrading systems with improvements and replacements. “If you wait for decay, it’s too late, like with teeth. Our constant endeavour of trying to improve the system defensively, draws on the red queen hypothesis in evolutionary biology – that a species has to evolve as fast as possible just to hold its own,” says Eckhardt. Major upgrades take place every 12 or 18 months, and minor ones two or three times a year – but the upgraded model always bears some resemblance to what was done before. Bill Eckhardt with University of Chicago Research students at The William Eckhardt Research Centre. Hot on the heels of the trend-neutral models introduced in 2017, short-term commodity select models were added in 2017, with other releases expected in 2019. Commodity models have been adapted to the unique features of these markets. When starting out, ETC “did not have enough data to distinguish financial markets from commodity markets, and so could not get separate inferences. Now there is more data and more liquidity. ETC uses different models for commodities, because they behave differently in price movement, notably in terms of asymmetry between up and down moves. They are an actual thing, and not the discounted cash-flows of a company. The risk proposition is different in terms of inherent leverage and market structure,” says Sorrentino. Long before adding these new models, Eckhardt was tweaking models by moving trading time frames around. Having started with short term models around 8-13 days, ETC added medium term systems with a 30-50 day time frame in 2002, before shifting shorter term again to an average holding period of 8 days for the flagship Evolution Programme. The most fruitful timeframe has been 8-10 days. These changes have all been driven by research and optimisation, and not by any discretionary decisions on trade horizons or styles. The changes have also stayed true to pure price theory, based on opening, closing high and low prices. Unlike some CTAs, ETC has never used fundamental data in its systems. For Eckhardt “how to combine heterogeneous information is a very hard theoretical problem. There is no principled way to do it. It is naïve to think that anything thrown into a system, that has information content, should improve that system. When you combine two systems, you can get something worse than one of them, and sometimes worse than both of them. From the start, the problems of fundamental data overwhelmed the advantages, so we decided it is not viable. It may work for other people, but not for our kind of research. I would never say never, but it seems unlikely we would revisit fundamental data”. Eckhardt’s legacy is that the pioneering tools he developed are now embedded in the process. ETC’s universe of 72 markets including metals on LME are chosen to match its style of trading and level of assets. ETC’s universe is based on liquidity and tradability to avoid undue friction or slippage; trendedness, and correlations. There is some turnover. ETC has added non-US and non-EU stock indices while some markets have been removed due to temporary or permanent liquidity issues or being performance outliers over long periods of time. ETC is always evaluating new markets but does not always find they have long enough data histories to get comfort. Somewhat unusually ETC trades foreign exchange through futures rather than over the counter. ETC has regularly investigated OTC FX currency forwards but finds sufficient liquidity to obtain good execution through futures markets, at its level of assets. “If we ran $40 billion we might do things differently. We could easily build an FX aggregator and take streaming prices from multiple venues if we wanted to,” adds Sorrentino. With holding periods now averaging around 8 days in the flagship program, ETC is clearly not competing with high frequency traders in millisecond timeframes. Eckhardt’s external hosted execution facilities are mainly for the purposes of optimising technology and helping with disaster recovery and optimisation procedures. “ETC has fully automated execution, with experienced trading and IT staff to monitor it, some of whom have been with the firm from the start. There is a suite of execution algorithms, some of which are tailored to particular markets. Offsetting trades are netted at the execution level,” says President John Fornengo. Slippage is monitored on every trade and has been declining over time (though it went up in one year). In addition, ETC’s University of Chicago collaborative research team was given a project to improve execution techniques which resulted in a variety of new research expanding in many directions. Execution techniques have increased potential capacity to $3 billion or so. ETC had previously been closed at peak assets around $1bn in 2008 and 2006. Historically, the commodities exposure was one capacity constraint, as Eckhardt judged that larger assets could lead to wider spreads when trading commodities. ETC has been open to investment since 2008 and has recently hired Nick Bolton to help expand its global presence. His considerable range of experience and skills are currently focused on raising assets globally. Already ETC are getting requests for new product, customised vehicles including managed accounts, and importantly in the UCITS space without commodity exposure. “There are relatively few investable short-term programs available in UCITS format currently that have the outstanding track record that ETC has behind it. ETC may well offer some models on a standalone basis, but free-standing versions look different and serve different purposes for investors than those in the context of our flagship multi-strategy vehicle,” says Sorrentino. ETC are open minded about launching liquid alternatives vehicles and are in the early stages of seeking a UCITS partner. ETC could also contemplate launching a lower fee, or flat fee, alternative risk premia (ARP) strategy with the right partner. ETC might talk to providers of seed or acceleration capital for new strategies or vehicles. ETC have also been approached by several potential strategic JV partners to develop programs that would trade local Asian futures markets. “This is due to Bill Eckhardt’s reputation as a pioneer in the space which has for years created a strong following,” says Sorrentino. Some of these markets exhibit price behaviour thus trading opportunities akin to that of Western futures markets back in the 1990s. We understand negotiations are in hand as testing has shown very interesting results; however, it’s too early to report the final outcome. Many CTAs were used as ATMs during and after the financial crisis, and Eckhardt is no exception. Subsequently, the big have got bigger, and many smaller CTAs have struggled to attract assets – even when they performed well. Post-crisis, Eckhardt has generated single digit annualised returns and has outperformed some larger CTAs. Recently, the firm resolved to institutionalise its structure, to become more attuned to the typical criteria of institutional allocators. “We recognise that institutional due diligence these days is very different from before the GFC, and that institutions have different requirements from high net worth individuals. We want to make sure that boxes are ticked,” says Bolton. This entails some organisational change. In common with many smaller hedge fund managers, Eckhardt historically had a fairly horizontal organisational structure – but is now making specific heads of business units accountable for different activities within the firm. Eckhardt as Chief Scientist and Head of Research, continues to be fully focused on research and trading, spending less time on operational issues. It is now very much “Team Eckhardt” with day-to-day management run by President, John Fornengo. The firm can rely on a number of key principals many of whom have a 25+ year history with ETC. These include Audrey Gale, Principal for Client Services, Administration and Business Development (who is also co-GP on two ETC funds), and more recent hire COO Rob Sorrentino. A strong internal compliance team is complemented by an external compliance consultant. “Eckhardt’s legacy is that the pioneering tools he developed are now embedded in the process,” says Sorrentino. The new structure might sound siloed, but it is not. The 23 staff across all trading and non-trading functions who once straddled two offices, are now being centralised into one office in central Chicago, at 300 South Wacker Drive, a few blocks down from CME Group. It is a modern, well-equipped building, with plenty of space for collaboration between research and trading. This is a good environment for clients to conduct due diligence. Technology has also been upgraded, for processing and transmitting orders, hardware, and hosting. Customised risk reports are provided by administrator NAV Consulting. ETC has a long relationship with Societe Generale Prime Services (SGPS), including its forerunners, FIMAT and CALYON, who helped launch a Cayman fund and also assist with capital introductions. Sorrentino worked with SGPS on reorganising the structure at his previous employer, FORT LP. “SGPS and Goldman Sachs are important strategic partners,” says Sorrentino. ETC also participate in events such as MFA Miami and are sought after as speakers at various conferences and capital introduction events. ETC are now actively engaged in a fresh marketing phase. Nick Bolton, an experienced strategic partner based in London, is now representing and expanding the ETC brand in Europe where institutional allocators are welcoming the ETC story.